Home » Observations » Some Stuff, an Update! This week I have some exciting things to report. 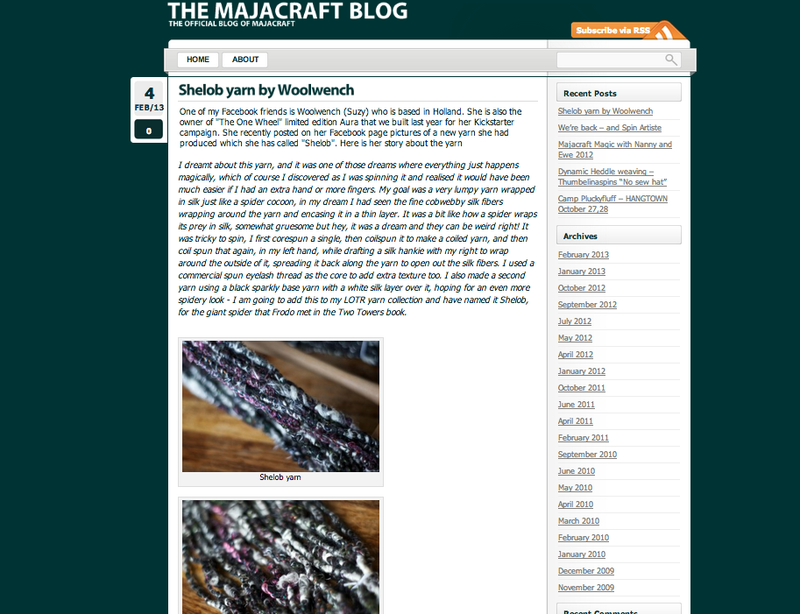 The first of which is a feature of my Shelob yarn on the Majacraft Blog! Thats quite a treat! I am sure everyone knows by now that I love my Aura and the beautiful design of Majacraft products, so to see my yarn design on their page is a real honour for me. The yarn itself is one I dreamed that has several steps to its creation, which include coiling a corespun coiled yarn, and wrapping in silk fibers. I really love the layers its possible to create with fiber, developing not just different levels of texture but also of colour. I made a mini video tutorial to share the technique, you can see it on You Tube HERE ,or if you are one of my US friends you can watch it HERE because the first link won’t work for you. I have loads more ideas for using this technique and experimenting with colour layers, so watch this space! This dark yarn version is going to join the LOTR collection of yarns on my website, to represent the giant spider Shelob that attacked Frodo in the Two Towers. I almost felt a bit spidery myself as I spread and wrapped the silk! 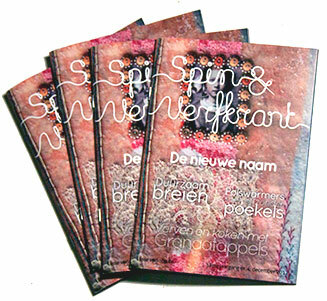 Second bit of news is that I have a new article coming up in the Dutch spinners and dyers magazine ‘Vezel’ (Fiber) formerly known as the ‘Spin en Verfkrant’. I met the publisher at an Etsy event in 2012 where I was selling yarn, and he asked me if I would be interested in writing some articles for the magazine, so of course I said yes! The article is in dutch, carefully translated for me from my English text by my husband, and in fact this was a learning curve for us both as we searched the fiber specific terms, because although he speaks dutch as a native (he moved here from Italy when he was 10) the fiber world does have its own vocabulary in every language. The article is my take on what art yarns are and the different kinds of yarns that fall into this category. The next article will be the beginning of some tutorials on how to make some of these yarns, starting with corespinning and the plying possibilities of corespun singles. I think this is a really nice opportunity for me to share stuff and hopefully connect with even more local spinners and dyers. I am also looking forward to seeing my work in print of course! More news, is that I am about to start preparing the brochures and course programmes for my upcoming workshops for 2013! I am VERY excited to be able to offer these! Coming up in March is the second Spindle Spinning workshop to be held at Woool in The Hague, we had a lot of fun at the first one, Pauline is a fabulous host with a great sense of humour and a newfound spindling skill! By the end of the workshop everyone was spinning yarn, and in the next workshop we will be working on plying techniques, making a lazy kate (a yarn holder to ply from) and I will teach an art yarn technique with the spindle. After that will be the second of my ‘Find Your Inner Fiber Hero’ workshops, this time with a focus on TEXTURE! One of the coolest things about handspun yarns is that they are so unique, and utterly different from anything that can be made commercially. In this workshop we will do some tailspinning, lockspinning, art batt spinning, and experimenting with added objects and unusual fibers (think upcycled cloth and ribbons!). I am looking forward to getting started on making the kits everyone will recieve, lets just say they will be packed with a very eclectic and colourful range of spinning materials! So far this workshop is half full so there are places available, if youre interested in participating though please let me know so I can get your name on the list, invoices are sent when I have the minimum number of participants and payment secures your place at that time. Also coming up later in the year, and of course I am hoping we can be joyfully sitting around the table in the garden soaking up the sunshine for this, is the Dyeing workshop. This is for sure going to be one of my favourites, I LOVE colour, and I have some cool techniques to share for getting some really intense colours in your fibers. Places are limited in this workshop as I want to be sure we all have time to create some masterpieces AND get them heated and set by the end of the day, and my list is also already half full, so dont wait too long if you want to join in! All dyes and fibers are provided in the cost, and you can also bring your own pre-spun skeins to handpaint too. Its going to be serious rainbow unicornish fun! So thats my task this week, to get the brochures made and up on the site. A happy task because I love playing with my DTP software and pretty pics. In the meantime, an overview of all upcoming workshops is right here on my site already, just follow the ‘workshops’ link above to find the info. Dear Woolwench, congrats on your yarn in the majacraft blog! Loved your picture of the shelob yarn, and also of the tree. Recognized it at once…. I still can’t get used to the empty spot. Change is the only constant thing in this life. Nooooooooo! I will miss that tree! It was part of homecoming for me 🙁 I grew up playing underneath it and sunny days picnicking on the grass in Clive Square. It will be a big hole in the scenery there, it was such a magnificent tree. 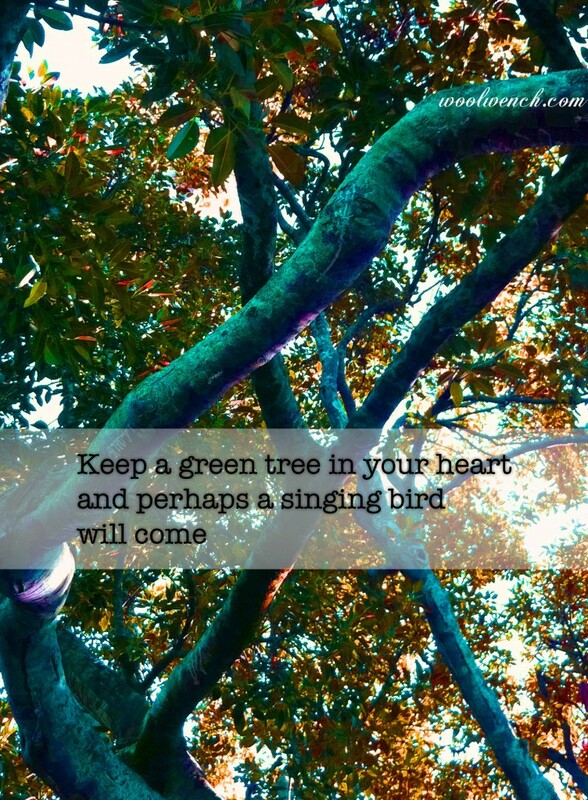 Well then I am very glad I have this photo of it, and maybe the proverb I chose for it was more fitting than I realised! I wish I could come to ALL the workshops! I’m looking forward to mine! And it’s so exciting you’ll have several articles in such a cool magazine! LOL I dont know about that Deidre, but I AM thrilled to bits to be in the magazine! I saw something in one of my books about adding feathers to yarns, those looked very cool but I’ve yet to try it. I worry that they’d just drop out as I’ve not tried trapping things in the ply. If you need any help with fiber specific terms maybe I can help out. Let me know if you want. Thanks Gabi! I might need that help, I will be writing some tutorials for Vezel this year and some of those words are really specific arent they! Suzy did you hear that Pam and I received over three feet of snow in Oxford CT in just one night. Yes! 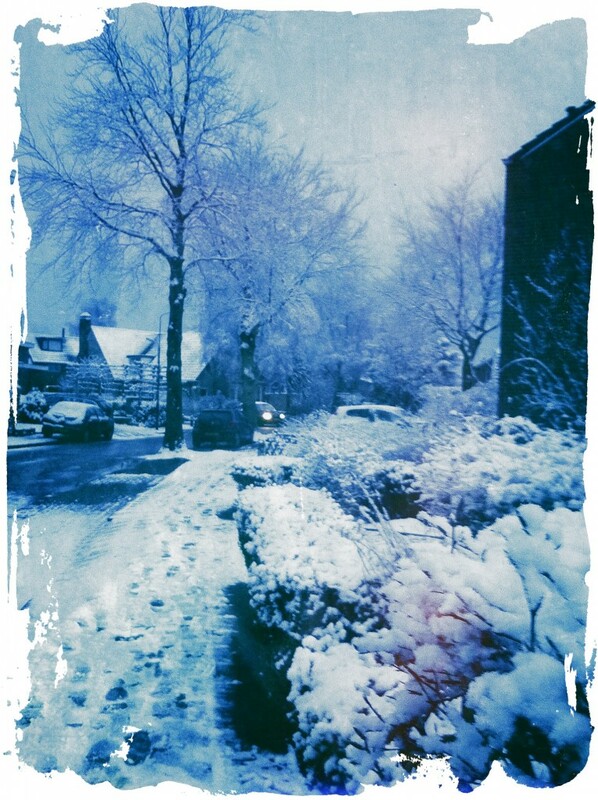 I saw Pams photos on her FB page – what an incredible amount of snow! I actually can’t even imagine what that would be like, I am pleased you all had a bit of time to prepare for it before it hit, I hope youre keeping warm and safe!